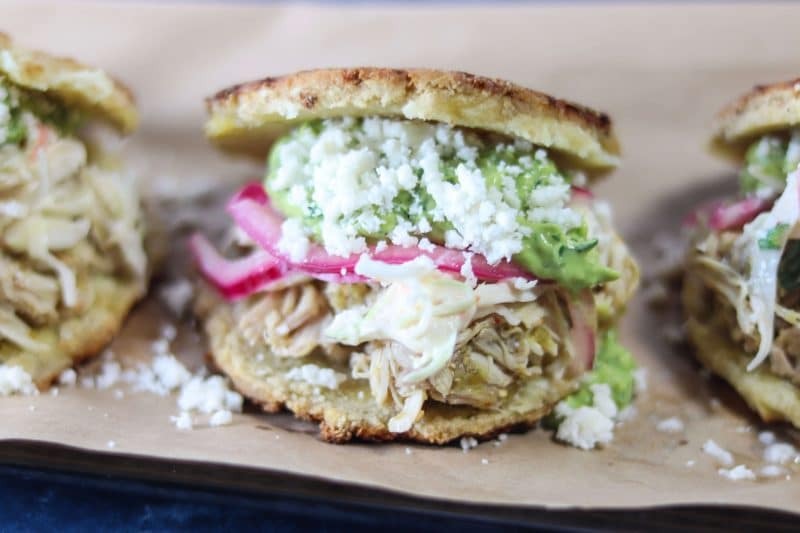 How to make Arepas: This Arepas with Chile Verde Chicken & Guasacaca recipe makes a low carb and keto friendly arepa dough stuffed with Chile verde chicken, creamy avocado sauce and a tangy slaw. 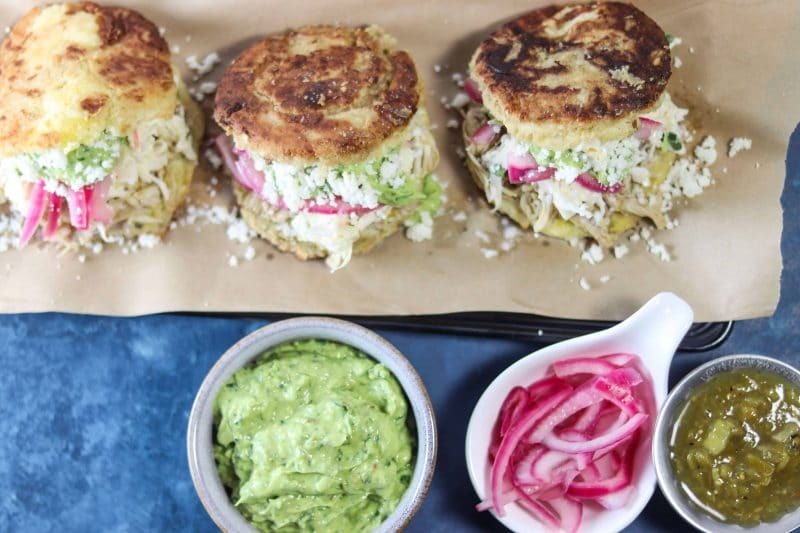 This past weekend, I made these Arepas and I thought about them all day after I had them and I’m still thinking about them because they were that good. 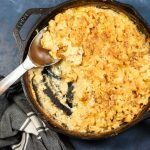 It’s always nice to find a new recipe you love to get into the rotation. 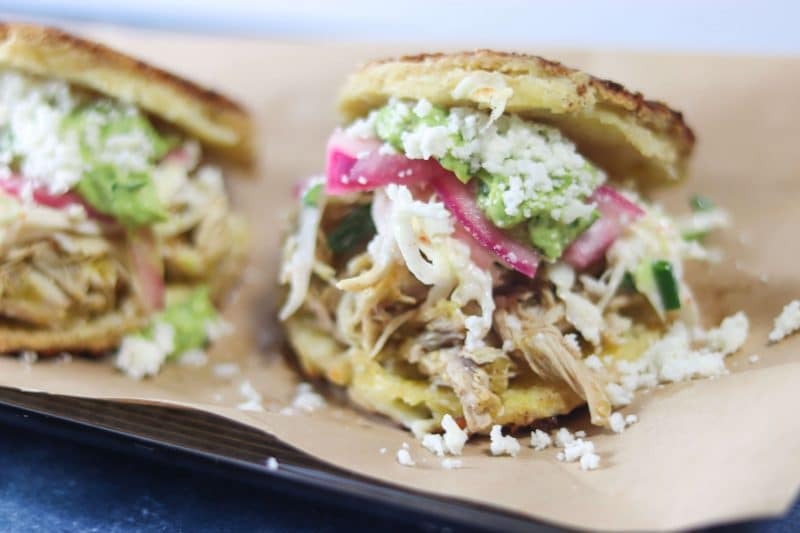 If you’re unfamiliar with Arepas, let me give you a brief background. 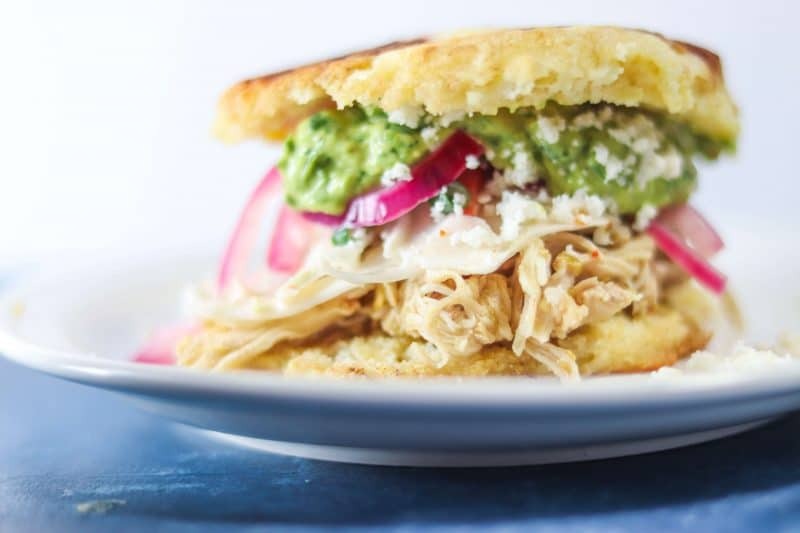 Arepas are a Venezuelan and Colombian dish, typically made from corn to form a round patty that’s either eaten plain, topped or stuffed with something like cheese, chicken, Avocado, etc. 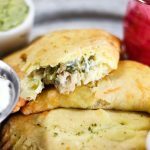 In this version, we’re making a low carb and keto dough and then stuffing it with tender and flavorful Chile verde chicken, a creamy Guasacaca (Avocado & Citrus Salsa) and a tangy slaw. Guasacaca, for those who don’t know, is a cool name for a classic Venezuelan Avocado sauce made with Avocado, citrus or vinegar, onions and parsley or cilantro. It goes so well on these and it would also be good on pretty much anything else you can dream of. 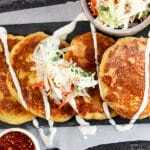 To be honest, I wasn’t sure how to make arepas before this and though we’re not using traditional flour to make these, the technique really couldn’t be easier. You just make the patties, cook them up then slice them and stuff them to your hearts desire. You could also just eat them by themselves! I’ll pretty much be making these on rotation now because they are that good! 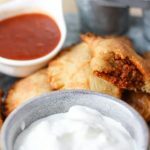 I’d make them tonight but I’m so nervous about the women’s USA vs Canada hockey game in the Olympics that I might not be able to eat! Who am I kidding, I’ll still be able to eat these because they’re really that delicious. 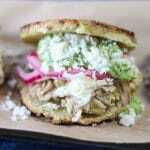 How to make Arepas: This Arepas with Chile Verde Chicken & Guasacaca recipe makes a low carb and keto friendly arepa dough stuffed with Chile verde chicken, creamy Guasacaca Avocado Salsa and a tangy slaw. Put mozzarella and cream cheese in a microwave safe bowl and microwave for one minute. Stir well (it's easy to use a fork) and then microwave for another minute. Stir again until well incorporated. Add in egg and stir well again to mix well. Once mixed, add in almond flour and then baking powder and mix well. Once mixed, put in plastic wrap in the freezer for 15 minutes (this makes it easier to work with). Take out and roll out dough about 1/2" thick on parchment paper, plastic wrap or a silicone baking sheet. Cut dough into patty sized circles using a cookie cutter or cup to measure circles. Continue until all dough is used, you should be able to get at least four good sized patties. Once they're all done, add butter to a pan or griddle (I used a cast iron pan) over medium heat and let melt then add the patties. Cook for three minutes on each side until browned. Put on a silicone baking sheet in 350 degree oven and cook for 10 minutes. Once cooked, salt lightly if desired. Once slightly cooled, slice Arepa in half. Warm up chicken and mix with green verde salsa. Set aside. In a bowl, mix together white wine vinegar, juice of 1 lime, sour cream and salt and pepper to taste. Mix well. Add in cabbage, carrots and green onion and mix until well coated. 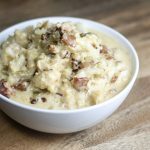 Put in the fridge and let sit for at least 15 minutes prior to serving. 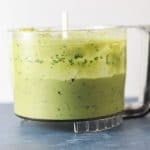 Add all ingredients to a blender and blend until smooth and creamy. If the sauce is too thick, you can thin it out with a little water. Slice the Arepa dough in half. Add shredded chicken, slaw and then a good dollop of Avocado Salsa. I like to crumble some Queso Fresco or Cotija Cheese on top and then add Pickled Red Onions for extra flavor. If the dough is too sticky to work with, add a little more Almond Flour. You can also put the dough in the fridge or freezer for 15 minutes prior to working with it to make it easier as well.